The building originally served as the meeting hall for Woodmen of the World, a fraternal organization for woodworkers. Artwork depicting these woodworkers is displayed and the halls are lined with old photographs. From the 1940s through the mid-1990s, the building was home to the Prince Hall Masons. Today the building houses Toro Bravo and the Secret Society Lounge, Ballroom, and Recording Studio. The ballroom and recording studio are available to rent for private events. Weekend nights are busy because many patrons waiting for a table at the ever-popular Toro Bravo head upstairs to S.S. for a drink. The Wonder Ballroom is next door so during show nights it can get downright crowded with people hanging out in the lobby, relaxing on the overstuffed couches and chairs. Even though the lounge is small we usually don’t have to wait too long for a seat. 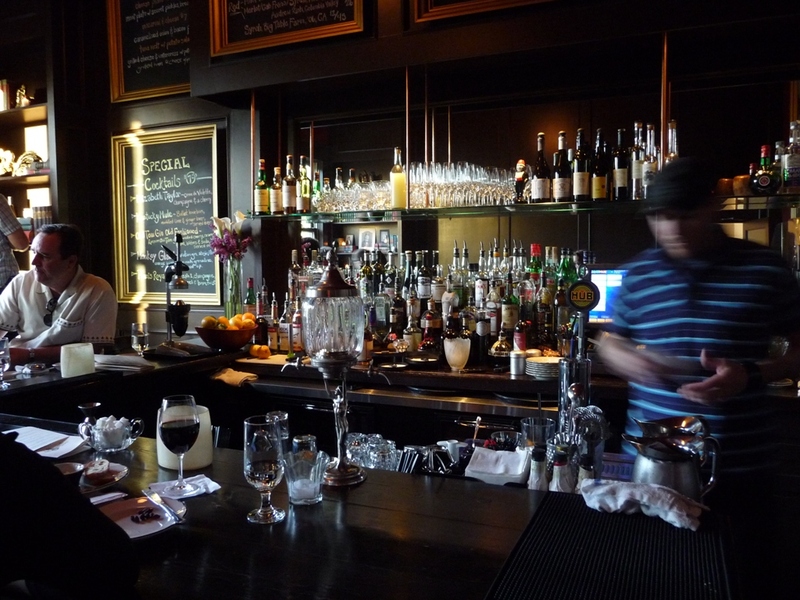 My husband and I often sit at the bar since it’s fascinating to watch the seasoned bar tenders create their concoctions. They take pride in the art of drink, and while watching we’ve learned a few tricks. Do you know how to curl the lemon peel before placing it in a drink or when to use a shaker rather than muddle with ice? We do, now! Normally I’m a red wine drinker but usually order one of the fabulous cocktails instead. My favorite right now is the Monkey Gland with absinthe, aviation gin, orange juice, and house made grenadine. If you enjoy licorice, I highly recommend some of Secret Society’s drinks made with absinthe. My husband loves the Moscow Mule served authentically in a copper cup used to add flavor. What I most love about their extensive cocktail menu is the brief history of the old fashioned drinks. Secret Society recently hired Chef Sandro Di Giovani who created a new food menu. The menu features small plates of “bar food” with a sophisticated twist. Last Friday we had Beet Tartare with Egg Mimosa and Watercress, not something we would normally order. However we knew the chef used to work at Alu so we trusted the odd sounding appetizer would be good. It did not disappoint! Later I ordered macaroni and cheese which is one of the best in town. I’m somewhat of a mac and cheese connoisseur and it was just the right mixture of salty and cheesy. My husband ordered the Italian Beef Sandwich with Secret Giardiniera and he was very satisfied. The only thing missing on the menu is a chocolate dessert. My husband and I enjoy long Friday evenings where we can sip our drinks and try new edibles or old favorites in a cozy environment. The Secret Society Lounge fits the bill perfectly. We are quickly becoming regulars. Secret Society Lounge is located at 116 NE Russell.